The program can only be used on FHA-insured loans. VA, conventional, and other programs are not included. The credit cannot be used towards the required 3.5% down payment. Closing costs, mortgage discount / origination point(s), and other closing costs can be covered by the credit. So although you can’t get your new home with no money out of pocket, you can use the credit to “buy down” your mortgage interest rate and/or even possibly negotiate a lower price on the home by minimizing the amount of money you would have to ask for from the seller for closing cost assistance. I am often asked the question, “How’s the market?” by home sellers, home buyers and various local and national reporters. Answers like, “Good” or “Not very good” – which are the type of sound bite answers TV and radio interviewers seem to thrive on – don’t really honestly answer the question. 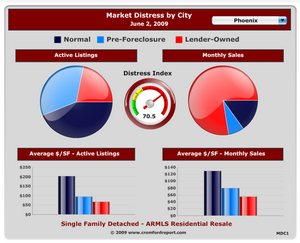 Our market varies by city and it also varies by price range. The short answer to the question above is: really good (as in ON FIRE) if we are talking about any home under 350k and a bit sluggish above 350k (the current maximum loan amount for an FHA loan is $346,250) gradiently getting worse, the higher the price range. In the upper, luxury market, inventory is so bloated that prices are indeed falling, even though homes in the one million plus market range are being sold, there are just so darn many of them. Sales to investors – which were less than 5% of the market are now higher than 20%. Correct, over 20% of all the homes being sold currently are being sold to investors. That is more than an interesting “market indicator”. It is a loud shout that they believe today’s prices are a bargain and they are voting with their feet and their checkbooks, saying, “Yes”.